In need of an afternoon tea delivery for your private party, meeting break or conference? Our afternoon tea delivery in Brighton, Worthing, Chichester and Horsham is deliciously crafted on the day: from freshly made finger sandwiches to homemade sausage rolls, along with freshly baked and ready to eat scones topped up with clotted cream and scrumptious strawberry jam, and a beautiful selection of traditional cakes and verrines. 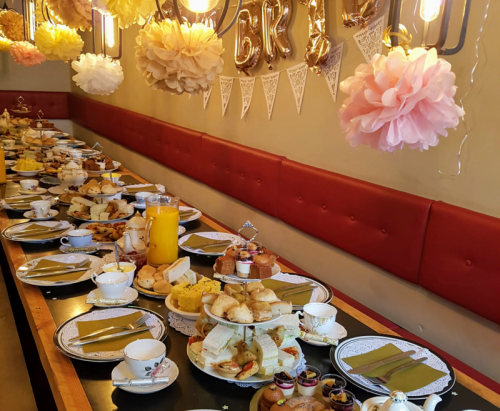 We’ve done full vegan afternoon teas as well as egg-free afternoon tea and gluten free afternoon tea too! Shots of fresh fruit salad, white chocolate mousse and raspberry coulis, raspberry tiramisu, Earl Grey and rhubarb panna cotta, lemon cheesecake with blueberry compote. Booking recommended at least 72 hours before your event day. Our aim is to deliver the best afternoon teas in Sussex for your private tea party or a more substantial meeting coffee break. Order your tea party for your hen party, Birthday party, meeting break, conference or wedding afternoon tea. We can also provide crockery, freshly brewed coffee and teas and waiting staff shall you require a full afternoon tea party service. And for special occasion, our Champagne afternoon tea will please all your guests.